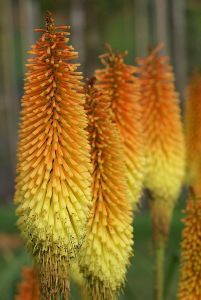 Buy Kniphofia Drummore Apricot: Garden Plants Direct from PlantsToPlant. Kniphofia 'Drummore Apricot' is an unusual, medium-sized, clump forming, deciduous perennial, with deep green, grass-like leaves. Erect stems with green buds opening into apricot pokers in late summer and early autumn. Prefers moist, but well-drained soil in the sun or part shade.